Within the epistle of St. Polycarp to the Philippians, the Divine economy is expressed more in terms of the Father and the Son. Nevertheless, the love of God and salvation which streams from God are expressed in a benediction contained within the epistle that is very reflective of the writings of St. Paul, combined with Polycarp’s own personality as he reflects on the importance of patience and longsuffering that sustains martyrs. In account of Polycarp’s martyrdom, there is a prayer from the lips of Polycarp that expresses Trinitarian terminology and Christian soteriology that reminds one of the Anaphoras of the Byzantine Churches. To the extent that it is an accurate recording of St. Polycarp, we have a strong sense of his view of the Holy Trinity and God’s action to save mankind. ”…Then he, placing his hands behind him and being bound to the stake, like a noble ram out of a great flock for an offering, a burnt sacrifice made ready and acceptable to God, looking up to heaven said; ‘O Lord God Almighty, the Father of Thy beloved and blessed Son Jesus Christ, through whom we have received the knowledge of Thee, the God of angels and powers and of all creation and of the whole race of the righteous, who live in Thy presence; I bless Thee for that Thou hast granted me this day and hour, that I might receive a portion amongst the number of martyrs in the cup of [Thy] Christ unto resurrection of eternal life, both of soul and of body, in the incorruptibility of the Holy Spirit. May I be received among these in Thy presence this day, as a rich and acceptable sacrifice, as Thou didst prepare and reveal it beforehand, and hast accomplished it, Thou that art the faithful and true God. In both the account of his words at his martyrdom and his own words to the Philippians, Polycarp shows his faith in God; Father, Son, and Holy Spirit. Like other Fathers dealing with docetism, St. Polycarp speaks of the Incarnation in very Johannine terms. Polycarp’s other words on Christ are less focused on the Incarnation of Christ as opposed to His suffering, dying and rising for the salvation of mankind. The reality of the incarnation is thought of in order to help one understand that the same sufferings of martyrdom which he and other Christians faced was already conquered by Christ Himself as our High Priest, as the above quoted passage so beautifully illustrates (Philippians 12:2). The bulk of Polycarp’s Epistle to the Philippians speaks very practically to the life and mission of the Church. Not only does he commend his readers to read the writings of Ignatius, he also speaks to serious problems of the holiness of the Church. The fall of Valens was used as a key testimony that the life of the Church is to be the Body of the Lord, whose name could be blasphemed through a poor witness. In praying for his restoration, he sees the salvation of the entire Body of Christ, which is key to the mission of the Church. In his martyrdom account, we also see that Polycarp was a man of prayer, and that his prayers had a focus on the Church. Through his prayers and instruction for the life of the Church, we see St. Polycarp was a bishop with a deep concern for his flock. In conjunction with the comments on priestly holiness and restoring the fallen, Polycarp wrote to the Philippians beautifully from a positive perspective on the Christian life that is desired by God. He spoke to what God desires for all estates of life, be they that of the priests, deacons, their wives, the widows, the young men, or maidens. As just one example of this vocation to holiness that Polycarp asks of his readers, let us focus on his writing to the younger members of the Body. The life of purity and submission to leaders within the Church is praised as the key to bringing joy and peace to the Christian life. Polycarp writes extensively on this, imparting words of wisdom for the faithful who reads his words. In addition to living a life of purity in day to day living, Polycarp’s own testimony as a martyr shows that virtue culminates in embracing the Cross of Christ. The above cited section (Martyrdom 14) from the martyrdom account makes it clear that martyrdom is not just a matter of not denying Christ-instead, it is the foremost means by which he has received his portion of Christ and the Holy Spirit. As the faithful gathered to receive his bones and venerate them each year on the anniversary of his martydom (aptly called a “birthday”, as Polycarp would like us all to see the life in his death), may we too learn from Polycarp’s vision of union with Christ even in death as the source of life. 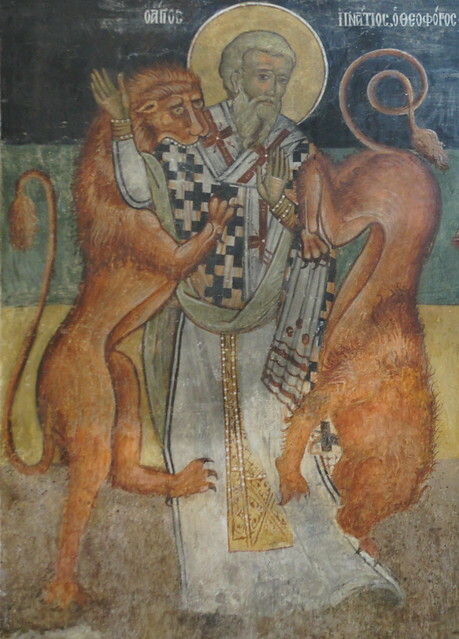 Doxologically, Ignatius offers praise to the Almighty in Trinitarian terms in the above quote, but more often he speaks of the relationship between the Father and the Son, and sees a mirror between the hierarchy on earth and the hierarchy in heaven, his destiny which weighed heavily upon his mind as he faced martyrdom. The relation of communion between the divine Persons is shown to be the source of unity on earth. And conversely, communion with one’s bishop is seen as the key to communion with God. Ignatius points out many implications of denying the reality of the incarnation. Apart from merely being factually incorrect, he ends this section of the epistle to the Trallians by pointing out that as the Body of Christ with Christ as head, we cannot have true union with Christ, if He did not truly take on our nature. The union with Christ would never meet without the shared human nature; like two parallel lines divinity and humanity would be separate for all eternity. Our salvation, therefore, depends on this reality to St. Ignatius. The sufferings of Christ would also be untrue, as a mere Spirit would not suffer. And lastly, the reality of Christ’s life on earth would not have been a true birth, true eating and drinking. The severity of this error is so grave that he calls for the faithful to shun those who proclaim this. His connection of the Eucharist to the Body and Blood of Christ makes it integrally related to the life for all the faithful, and is the vitality of the Church. Elsewhere he uses the phrase “medicine of immortality” to describe the Eucharist, in his Epistle to the Ephesians. The sacramental life of the Church is therefore of critical importance to Ignatius. Another important factor which was mentioned above is the mirroring of the Persons of the Trinity within the hierarchy of the Church. Because Ignatius sees a connection between the Bishop and the Father, as well as Christ with the deacons, and the presbyterate with the Apostles, Ignatius sees the mission of the Church to be a reflection of God who is Love in three Persons. With such a divine calling and identity, the Church must be viewed as the divine institution that it truly is, and not some pragmatically based association of likeminded people. It is our source of life, which brings Christ present through the Eucharist, and through His Presence in each of us. Like the Identity and Mission of the Church, the approach to understanding salvation and the Christian life in the writings of Saint Ignatius must be seen as one that incorporates the unity of the local Church as headed by the Bishop, and the sacramental blessings which flow from it. As a martyr, Ignatius also poignantly felt his connection to God through offering his life and death to God. Two reflections on his road to Rome make this connection clear. Martyrdom is not just a calling to stay faithful to Ignatius’ identity of Christian-even more deeply, he sees that his discipleship is made true through the grinding of his body (the wheat) into death, which produces the spiritual bread. His calling as a martyr beautifully underscores the connection between Christ’s suffering for mankind, and that which is offered in his own life. Growth as a Christian is sacramental, hierarchical and mystical through the life of the Church. But to Ignatius, salvation in Christ is also mystical in his martyrdom, which mystically reflects Christ’s life and death in his own life and death. Therefore, there is clearly a seed of Trinitarian worship and praise that underlies St. Clement’s writings. St. Clement writes of Christ God our Redeemer in His Incarnation with the wonder and awe befitting it. Despite being God, Our Lord did not disdain to become man, and St. Clement uses this truth to instill fear and humility, which is needed of his Corinthian readers. This imagery of a body hearkens back to St. Paul’s first letter to the Corinthians, with perhaps more emphasis on the importance of unity and respect for the diversity of the Church. “How blessed and marvelous are the gifts of God, dearly beloved!! Life in immortality, splendor in righteousness, truth in boldness, faith in confidence, temperance in sanctification! And all these things fall under our apprehension. What then, think ye, are the things preparing for them that patiently await Him? The Creator and Father of the ages, the All holy One Himself knoweth their number and their beauty. Given these reflections, we see in this Apostolic father a wealth of appreciation for the Body of Christ and the gifts which flow from it. In addition to the above-mentioned examples of Christ’s Incarnation, which show how it is we are to be saved, the wonders of humility that flow from our call to walk in a life of obedience and the blessing of immortality which flows from the Church, Clement writes elsewhere of our salvation in Christ. One important message that we learn from his writings is that salvation is an ongoing journey. To reconcile the false dichotomy of faith vs. works, St. Clement and all of Tradition with Him understands that the faith and glorification comes through the will of God, who walks with us in the path of synergy. This gives a sense of St. Clement’s view of salvation in Christ, as it relates to growth in virtue and the life in Christ. We can quote from the Catechism of the Catholic Church and understand that the Scriptures can be understood in four senses. However, as Dr. Scott Hahn has noted in Worship in Word; Toward a Liturgical Hermeneutic. (Letter and Spirit), an important hermeneutical principle is one that has a liturgical perspective. Since the canon of Scripture and its interpretation can be seen so clearly in the selection of the passages used for liturgical purposes, the present essay seeks to describe the four senses of biblical interpretation, and then show how Byzantine Christians can be nourished by all four perspectives of scriptural hermeneutics in their liturgical life of prayer. First, with regard to the literal sense of Scripture, there are many ways that Eastern Christians can understand the presence of Christ speaking to His Church in the Scriptures from a literal sense. One example is that of the Communion Hymn (Koinonikon) for the Ascension of the Lord, which is celebrated forty days after Pascha. For this hymn, Psalm 46:6 is quoted, which states: “God ascends amid shouts of joy; the Lord amid trumpet blasts.” Here at Communion we are singing from the Psalms, which prophesied that God Himself would ascend amid shouts of joy. One key way in which this verse was fulfilled literally was at the Ascension, which is recorded in the Acts of the Holy Apostles. By choosing a communion hymn from the Psalter that has a literal fulfillment in the feast, the faithful who pray this can learn that the Old Testament foretold our Lord’s glorious Ascension. We put the literal sense of Scripture into practice through this song. As an example of understanding the allegorical sense of Scripture, the Feast of the Dormition invokes the faithful’s hearts to see Scripture in just such a manner. At the Alleluia verses of the Feast, we read “Go up Lord, to your rest, you and your holy ark”, which is a quotation from Psalm 132. Clearly the literal sense of this passage of Scripture evokes the ark of the covenant, in which the presence of God dwelt among his Old Covenant people. However, the allegorical fulfillment of the ark has been seen through the Fathers to be the Theotokos, who bore God Himself in her most holy womb. At the Feast where we commemorate her falling asleep in the Lord and having her body assumed into heaven, we have this Scriptural passage that literally speaks of the ark of the covenant. However, the spiritual sense goes beyond literal fulfillment, whereby the Theotokos is allegorically seen to be the ark of the Lord. The ascent is more than just a literal and earthly ascent to Jerusalem, but is allegorically an ascent to the presence of God where the Theotokos’ body was assumed. As such, Byzantine Christians sing this Psalm on the feast of the Dormition, which enables them to see Scripture in the allegorical sense, which is ultimately more real than any literal fulfillment could be. The healing of the paralytic in a literal sense was a call to see the power of Christ to transform a broken physical body. As we chant on this Sunday, the literal sense of Scripture is transfigured into a moral reading of the passage, whereby our sins that paralyze us are compared to the debilitating effects of our own sin. The Gospel passage that is read on this Sunday (John 5:1-15) is given the moral sense through our singing the kontakion, which elevates us to understand its spiritual application to our own lives in the world today through the moral sense. Lastly, there is the anagogical sense of Scripture, which looks to the eschatological reality of heaven where the Church as the Bride of Christ is united with God forever in Heaven. In the prayer of the Anaphora of St. John Chrysostom, the ultimate reality of our divine destiny with Christ is shown in the eternal perspective offered in the priest’s prayer. The celebrant prays in the Anaphora: “Remembering, therefore, this saving command and all that has come to pass in our behalf: the cross, the tomb, the resurrection on the third day, the ascension into heaven, the sitting at the right hand, and the second coming in glory: Offering you, your own, from your own, always and everywhere…” In our liturgical practice, the literal reality of the Second Coming mentioned in Scripture in passages such as 1 Thessalonians 4:13-18 is exalted into an anagogical sense, whereby our contact with God through the Divine Liturgy is so deep that the eschatological future is remembered as though it were not future. Our union with the God who is eternally Present allows us to leave the bonds of time itself, and our liturgical prayer speaks to this anagogical reality. Many examples of the ways that our liturgical life brings the different senses of Scripture to life can be provided. Through ever deeper reflection on our liturgical life and the senses of Scriptures, we can grow in this understanding as Eastern Christians. So often the words of Holy Scripture are used to justify Scripture as a rule unto itself. And yet, Scripture not only does not teach that it is the only rule of faith, it also does not teach which books comprise it in a definitive manner. We also know that the Bible is a collection of books—it is not a singular entity discovered as is alleged of the Quran or the Book of Mormon and associated writings “found” by Joseph Smith. Rather, understanding which of the ancient writings of the Jewish people comprise the Old Testament, and which of the early Church writings comprise the New Testament, was an active interaction between the available texts and the life of the Church. Specific books found their approbation and eventual canonization through the liturgical life of the Church. The liturgical hermeneutic is set forth by Dr. Scott Hahn in his writings (Hahn, 101-136). The goal of the present essay is to offer some reflections on how the Canon varies between Roman Catholics and Eastern Orthodox, with an emphasis on the unique position that Eastern Catholics face with this issue. Through this tension, I argue that the same principles that led to the first 73 books of the Catholic Bible to be canonized could offer a path for reconciliation about books not yet canonized by Catholics. This response was driven by the fact that Protestants lowered the size of their canon of Scripture to 66 books instead of 73, and that among the 66 books certain sections that have originals only in Greek (e.g., Esther and Daniel) were rejected. It is clear that the Magisterial teachings have harsh words for that difference of the canon. In contrast, the Orthodox have a different canon which includes the books in the Catholic Bible, but also includes some other writings. Does Trent therefore condemn the Orthodox for having a different canon of Scripture? I would argue that this is not the case based on two main lines of thinking. First, it is important to note that the canon from Trent issues judgment for those who would remove books from the Catholic Bible. That other Christians in the East have other books in their canon is not the focus of Trent. Next, it is important to note that with regard to Biblical Scholarship, the Latin Vulgate was never meant to be normative for all Catholics. Its venerable place in the Latin Rite does not make the Greek Scriptures irrelevant. Instead, calls to understand the Greek texts are clearly made by the Magisterium, as can be seen in the Papal Encyclical Divino Afflante Spiritu, which states that the use of the Vulgate “concerns only the Latin Church” (CF 233). Thus, authentic traditions of using the Greek Bible might point the way to reconciling books in the Orthodox Bible not found in the Catholic Bible. Along these lines, there is the liturgical hermeneutic that emphasizes that the Orthodox canon of Scripture has something to offer to the whole Church. As Eastern Christians in communion with Rome, Eastern Catholics utilize the Prayer of Manasseh, which is listed as apocryphal in the Latin Vulgate, but is part of the Orthodox canon. This prayer is referred to in the beginning rites of confession, and is recited during Great Compline. Reflecting upon other disputed books of Scripture such as the Apocalypse and 2 Peter, their liturgical use eventually led to their acceptance into the canon. The sensus fidelium bore forth the validity of these books. In our own day, as ecumenism is leading to more and more rapproachment between and Catholics and Orthodox, the liturgical use of the Prayer of Manasseh that exists in the Byzantine Catholic Churches may offer fertile ground whereby the differences in the Catholic and Orthodox Canons of Scripture could be reconciled. Through the prayers of our holy fathers, may these discrepancies end in the same manner as they once did with other books of Scripture, through liturgical reflections, and the unified voice of our Bishops. Dupuis, Jaccques (ed.) The Christian Faith-Doctrinal Documents of the Catholic Church. Alba House. 2001. Print.